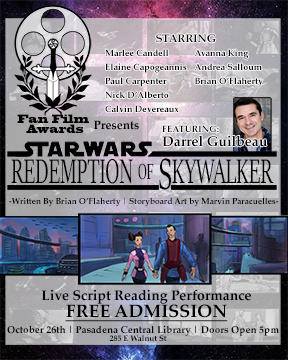 FanFilm Awards is at last fulfilling their award to the Best Script – Star Wars: Redemption of Skywalker, by Brian O’Flaherty – at the Pasadena Central Library. Featuring Anime Voice Actor, Darrel Guilbeau. Please join us by reserving your seats today! The role of Anakin will be played by Award Winning Screenwriter, Brian O’Flaherty. This entry was posted in 2016 and tagged azure lorica, azurelorica, brian OFlaherty, darrel guilbeau, feature, featured, live reading, Pasadena, redemption of skywalker, star wars. Bookmark the permalink.